Is this line secure? You have been selected . . .
CoLab Theatre presents the most cutting-edge, immersive gaming experience in London. You and your team will utilise up-to-date phone apps to scour the streets of London on the ultimate cloak and dagger mission. Discover secret packages, decipher coded messages, track enemy spies and uncover the city's covert treasures. Harnessing the most creatively advanced multimedia and mobile technology, Fifth Column promises a fully-fledged theatrical spy thriller, in which you are the star. Tickets released in August 2014 - sign up to the newsletter for advanced bookings, additional content and special offers. 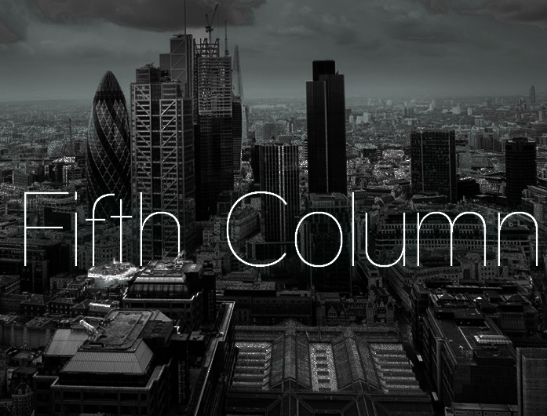 CoLab are taking bookings for tailored packages of the Fifth Column. If you'd like to give a friend or loved one a celebration they will never forget, click below. A fifth column is a group of people who undermine a larger group, such as a nation or a besieged city, from within. The activities of a fifth column can be overt or clandestine. Forces gathered in secret can mobilise when coordination with an external attack requires and extend even to uniformed military operations as part of a coordinated campaign. They can be clandestine, involving acts of sabotage, disinformation campaigns, or espionage executed within defence lines by secret sympathisers with an external force.